Jean Alesi has started 201 grands prix for Ferrari, Benetton, Sauber, Jordan, Prost and Tyrrell - but his experience of oval racing in the United States is zero. So, to anyone who doesn't know him, making his oval debut in the Indianapolis 500 - with legendary team Newman/Haas, no less - seems far-fetched and outlandish. Q. So your Indy 500 plans have finally come together? 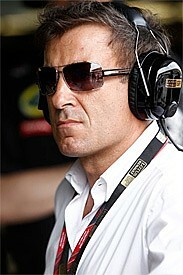 Jean Alesi: Yes, it's going to be with Newman/Haas and it was signed yesterday. We have a lot of details still to decide, such as when I'll be in the car for the first time, all those kind of things. For me, it's fantastic because I need as much support as I can get, from the team - even from the fans, I will have to ask them how to drive there! Q. How did it feel when you sealed the deal that will take you to Indy? JA: I'm always very committed to everything that I do. Believe me, this is one of my most exciting moments since I drove in Formula 1. Since we announced it a year ago it has taken some time to come together, but now I can just concentrate on driving. Q. How are you feeling about the scale of the challenge? JA: I am extremely excited about it. I'm not worried, but I feel a big pressure on me. I will try to be as fit as possible and to be in top condition to do a good job. It's a magic surprise for motorsport to do something like this, especially in my case, because I love so much to drive and to race in good programmes. To race at Indianapolis will be amazing. Q. Has the Lotus engine deal in IndyCars been key to this deal? JA: The whole issue for me competing in this race was because I'm the Lotus ambassador. I don't even know what to prioritise because I have so many points to learn and go through. I am taking it very seriously, I have massive experience in motorsport, but it's the first time for me in this kind of competition. I need to be low-profile, to fulfil the expectation of the team, and I'm sure I will perform. Q. How do you feel about going through the rookie orientation process? JA: Actually for me, that will be a good thing. The process is very big, and I want to start without any kind of worry to be in the top speeds straight away. I want to follow the procedure and get a good feeling at lower speed, to build up to a reasonable speed. Q. What are your targets? JA: Well, you know, targets are always the same in my mind. I will do the best as possible. I know I have to be realistic, and I know it's been a long time since I've raced a single-seater car. There are so many points I need to put together, I don't know which one is the main priority right now. In my mind, I am prepared to take on this challenge. I feel I have a big competition inside of me. I am a fighter. I am sure I will do well. Q. Is there a chance you might do some extra races in the IndyCar Series? JA: For the moment, it is just Indy. Q. When are we first going to see you on the track? JA: I don't know, because the timing is so fresh between Lotus and Newman/Haas. Very soon I expect more information.